About 2% of all cancers in dogs are nasal cancers, out of which 80% are reported as malignant (fast growing) in nature. Carcinomas are the most commonly occurring type of dog nose cancer, with another type, adenocarcinomas occurring frequently. 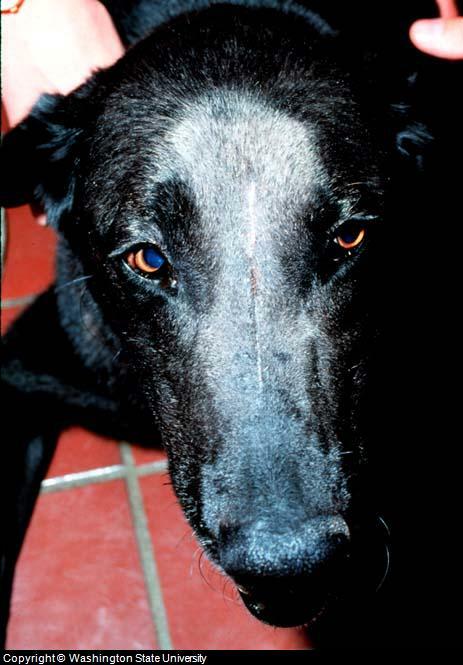 Fibrosarcomas, para–nasal fibrosarcomas etc are other types of nasal cancers in dogs. Long nosed breeds, older dogs and males are comparatively more susceptible to any type of nose cancer. It is estimated that tumors that occur in the nose are comparatively more invasive, progressive and dangerous due to the complex anatomy in this area and easy mode of metastasis (spread). As canine nose cancer has a higher potency of metastasis, thus the cancer will surely spread to adjoining lymph nodes, a dog's lungs and brain in advanced stages of the disease. If the condition is left untreated, an affected dog may not survive over 5 – 6 months. Nasal discharge and symptoms specified for the upper respiratory tract and nasal passage occur frequently. Nasal discharge is either unilateral (on one side) or bilateral (both sides). In all likelihood, a problem will be unilateral while in advanced stages it will be bilateral or on both sides of the nose. Other then nasal discharge, periodic sneezing, bleeding from the nose (epistaxis), anorexia (appetite loss) and respiratory stress may be noticed, which ends with difficultly breathing. Once cancerous tissues spread, facial deformity is noticed. It occurs due to the severe damage and destruction of nasal bones and sinonasal bodies. Massive spreading is thereafter noted, in which lymph nodes, the lungs and brain is severely affected. Nervous system signs start to appear such as blindness, a lack of muscle coordination, seizure and coma may occur. Other severe respiratory symptoms may also appear including signs of cough, hurdled or difficulty breathing and generalized loss of body conditions are noted. A history of the condition, clinical symptoms and elimination of other possible nasal abnormalities can help in indicating dog nose cancer. Laboratory diagnosis by biochemical profiling and by taking a detailed biopsy of nasal content and tissues is required. Plain x-rays are usually not helpful in making a diagnosis due to the complex anatomy of the nose, thus tomography is usually preferred in making a confirmatory diagnosis. It not only confirms the condition, it can also indicate the stage of nose cancer and the severity of the condition. Treatment depends on the type and location of the dog nose cancer. Moreover, the degree of metastasis will impact any progress that can be made toward recovery. Radiation therapy is the treatment of choice for any type of dog nasal cancer. Though difficult to operate, aggressive surgery, chemotherapy and radiation therapy if combined, can be effective, if a diagnosis is made during an early stage of the disease. Support for reducing the effect of any symptoms and for maintaining cellular strength is essential. Other then specific drugs used for this purpose, natural remedies such as C-Caps Formula can be effective, but should only be used with the advice of a veterinarian. Additional support for the respiratory system can also be provided by a remedy that is made to improve respiratory health such as Respo-K . If a diagnosis is made during an early stage of the disease and if treatment plans are implemented prior to metastasis or the spread of the cancer, recovery is possible. If metastasis has occurred and nervous system signs are exhibited, such dogs usually do not survive for more then 6 months and the prognosis stands as, “Grave”.